We are backed by our expertise in this domain, we offer our valued clients with Blending Machine. We are leaders in manufacturing and supplying blending machine. Our range of Blending Machine comprises of products such as Mild Steel Blending Machine and Stainless Steel Blending Machine. These are built with using high quality raw material procured from our trustworthy vendor base to ensure that they are in compliance with international quality standards. We offer these blending machines at a market leading price range. Owing to our profound experience in the industry, we have been able to offer our clients with Coffee Blending Machine. 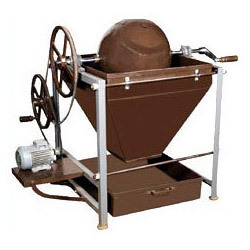 These blending machines comes in ball shape design which ensures an effective amalgamation of coffee power, chicory power and other ingredients. Our blending machine are used in various food processing industries. Our offering of blending machines are in high demand by our clients for it superior built and long lasting nature.